VeriCite DocumentationUser GuidesBrightspace User Guide LTI Content Item Integration - Admin ArticlesHow do I enable VeriCite for my Brightspace instance as an admin? 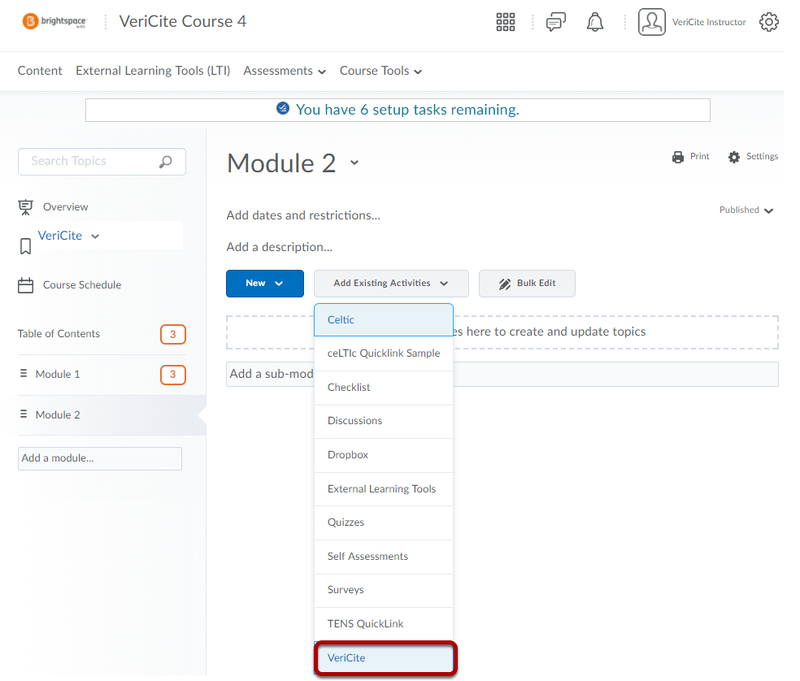 Before your users can add VeriCite as a tool in their courses, you will need to add it as a third-party certified LTI tool for your instance. Once this has been done at the admin level, individual instructors will be able to add VeriCite to their courses. Setting up the VeriCite Content Item integration is done by creating a Remote Plugin. From the Admin Tools menu, click Remote Plugins. On the Manage Remote Plugins page, click New Remote Plugin. If you want to add the third party tool as a source of content when using Insert Quicklink or when creating content topics from Content, select Quicklink (CIM) and specify the dimensions of the dialog box that presents the content available for insertion to the instructor. If you want to add the third party tool as a source of content when using Insert Stuff, select Insert Stuff (CIM). If you want to make the third-party content provider available to instructors from Course Import in Table of Contents and Import/Export/Copy Components, select Course Import (CIM). Enter the Name of the tool that is displayed in the Brightspace Learning Environment menus. Note: D2L recommends using a label that instructors will recognize. Enter the Launch Point URL provided by the third party tool provider. The URL must include either http:// or https://. Enter the LTI Key and the LTI Secret provided by the third party tool provider. Enter an optional Icon URL. Click Add Org Units and search and insert the org unit(s), in which you want the instructor to see the plugin. Note: If you do not select a specific org unit, the plugin will only be available at the default org unit level. VeriCite will now be listed in the Add Existing Activities drop-down menu. Zoom: VeriCite will now be listed as an LTI tool.